Written by Shannon, aka Cassandra. Sometimes you simply can’t avoid getting sick. This week I caught a cold which resulted in a husky alter-ego that Nick named “Cassandra.” So don’t mind the raspy co-host for today’s episode. Ironically, we’re talking about health & fitness apps today! Specifically, Nick and I share our favorite apps that we use every day, then we go through apps from listeners and friends who submitted their picks. Following up on our previous episode where I reviewed the Fitbit Charge 2, I dive into the user-friendly mobile app that serves as the real power behind any Fitbit. This free app is where you setup your actual Fitbit device, establish your goals, and even where you can track a few other handy health and fitness items. The Fitbit app includes a very easy user interface, with a main screen that highlights some of your main daily metrics like: steps, floors climbed, miles covered, calories burned, activity and water consumed. You can also get info on your resting heart rate, calories consumed, sleep, etc. The best part is the integration with other apps, including Nick’s food log app that he breaks down further, and the peloton app, which sends workout info from the bike to your Fitbit app. Nick provides a review of the Lose it! app, which is a food journal. While neither of us are big on counting calories, we do like holding ourselves accountable and it’s easy to lose track of what you’re eating. This app is a great way to ensure you’re truly seeing how much macronutrients you’re taking in each day, your calories consumed and your calories burned. The food catalog for Lose It! is truly impressive with millions of food items, ingredients and meals alike, already logged into the database. You can even scan barcodes with a built-in barcode scanner to make it easy to identify specific food items. Snap it!, which is an extension of the Lose It app, even gives the option of identifying food by snapping a picture, which it then tries to match up to corresponding nutrition information. It’s just not incredibly accurate, so it’s more effective for simple items (e.g. piece of fruit, protein bar, etc.). There is a premium version of the app, but the free version offers great options and even integrates with other fitness apps to provide information like steps and exercise. At the end of the day though, it doesn’t matter if you use fitness apps or not. Use whatever tools you need to hold yourself more accountable and help you to reach your fitness goals. We wrap up this episode getting amped up for the new Facebook Live workout that is now available on the ETT Facebook page. Perfect little 25-min workout video that includes a warmup, 15 min HIIT workout and an ab-centric cooldown.We’ve got exciting episodes coming up; please reach out at elementaltampa@gmail.com and let us know what topics you’d like us to discuss on a future episode. Thanks for listening! If you’ve been paying attention to my weekly menu spotlights, you’ve probably realized that I don’t discriminate when it comes to food. Well, that’s not entirely true. I do my best to stay away from anything that contains refined sugars and grains, but other than that I’m an omnivore through and through. I say that because last week’s post and today’s post feature foods that are not exactly vegan friendly. I want my vegan friends to know that I’m not discriminating against you all. Shannon is a former vegan and she still makes some delicious vegan dishes and I promise to feature one in an upcoming post. But today’s post is dedicated to very special type of red meat. The steaks featured below can’t be found in the grocery store. They don’t come from any factory farms or feedlots. They come from the fields, woods, and prairies. These are steaks from a whitetail deer. Deer meat, better known as venison, along with other wild game meat tend to have lower caloric and fat content but equal amounts of protein compared to meat from conventionally raised livestock. Venison in particular has approximately 150 calories, 24 g of protein and 1.5 g of fat per 3.5 ounce serving (source). Any regular readers of the blog will know that I am not afraid of fat so the idea of the meat having less fat doesn’t exactly thrill me, but venison and other wild game have a better ratio of omega 6 to omega 3 fatty acids, which researchers have found could help mitigate certain chronic diseases/conditions (source). Eating wild game like venison not only provides nutritional benefits, it also allows you to be less reliant on factory farmed meat. Legit wild game is not regulated by the USDA, which means it cannot be sold in supermarkets. I believe this is a good thing because it inspires people to take up hunting or in most instances, connect with a friend or family member that does hunt. Having grown up in a hunting family, I can tell you from experience that hunters are extremely generous when it comes to sharing their harvest. Take these folks up on their generosity because the less reliant we are on meat from factory farms, the better off we, and the planet, will be. If you already eat wild game on a regular basis, let us know what your favorite type and preparation method is. Feel free to contact us elementaltampa@gmail.com with any recipes. The first month of 2017 is nearly complete and some may be welcoming new habits after weeks of hard work setting new routines. On this week’s podcast, Nick and I kick-off by sharing the things we’ve added to our own fitness/health routines so far. Nick started the year by doing a series of monthly challenges. For January, he’s given up an overindulgence – alcohol. In addition, he’s incorporating daily morning workouts to try and lose the pesky holiday pounds that almost all of us pack on. I, on the other hand, finally started exploring a quest into a new topic of my health, which is also the topic of our podcast today – Heart Rate Monitoring and Training. In order to better understand my own heart rate efficiencies (or otherwise) I invested in the best monitor for the money I was looking to spend and bought the Fitbit Charge 2. My motivations for wanting to better understand this element of fitness and how it contributes to my health comes after long battles with stress and poor sleep, two things many people are likely grappling with as well. The Peloton classes introduced me to how heart rate training can improve your fitness and I had read countless articles about how it benefits your overall health. The Mayo Clinic states that a normal resting heart rate (RHR) for adults is 60 to 100 beats per minute. Fitbit compiled their substantial user data and estimated 50-90 BPM is average for an adult. In terms of exercise, Zone 2 training is how many athletes build endurance. It’s all about low intensity for long periods of time – staying in that fat burning zone. I’ve been experimenting with some of the Zone 2 training on the Peloton so far and have already seen some impact on my RHR. Much of what I’ve learned in the last few weeks is due to my Fitbit Charge 2. Costing a fairly reasonable $130 (to start) the Fitbit Charge 2 was highly rated by CNET, even more so since Fitbit launched a software upgrade late last year. In the last part of the podcast I get into the details of my own review of the fitness monitor, including the ups and downs (because nothing is perfect, right?). Some of the features I like most include a cardio fitness rating. It gives a rating based on its estimated VO2 Max and indicates your overall performance in endurance-based activities. Currently, mine is sitting around 38-42, which is “good – very good” for a female of my age (positive sign!). The app is a whole other side of this product, which we’ll get into in a future episode, but as of now, I would recommend the Fitbit Charge 2. It holds me to new levels of accountability, further helping me stick to a healthy lifestyle. Now all I need to work on is adding some friends to my Fitbit circle! We’d love hear what goals you set or accomplished so far this year. Please feel free to share them with us in the comment section, on Facebook or email us at elementaltampa@gmail.com. Your feedback and support has helped us grow into a 5 star rated podcast and we are extremely grateful. Keep rating, reviewing and sharing the podcast and let’s stay healthy year. Shannon’s saucy tomato eggs dish is one of my favorite brunch options. I mean favorite of all time! I prefer it over 90% of the stuff I can order at my favorite brunch restaurant. What’s not to like? Fresh herbs & veggies – good. Italian sausage – good. Eggs – GOOOOOD!!! The combination of ingredients creates an absolute flavor explosion, but I’d be remiss if I didn’t mention my favorite part of this dish. I’m sure you’ve already figured out from the title of this post, that it’s really an homage to eggs. Let’s be serious folks, eggs are the best whole food on the planet. I know vegans will disagree but one egg provides 6g of protein, 5g of fat (1.5g saturated) and 0g of carbs. They also provide essential micronutrients like choline, selenium, and leucine, which is essential to the production of muscle protein (source). If the nutritional benefits aren’t enough, the number of ways you can prepare them is almost endless. I don’t want to go on a Bubba Gump-like rant, but you can enjoy eggs fried, poached, scrambled, basted, hard boiled and I’m sure there are preparation methods I don’t even know about. If you’re interested in making some saucy tomato eggs at home, check out the recipe on Shannon’s site. If you think you have an egg dish that can rival Shannon’s saucy tomato eggs, which is highly unlikely, send some pics or a recipe our way so we can check it out! You can always leave us feedback either on Facebook or email us at elementaltampa@gmail.com. *I’m not a certified dietician so you should seek a professional’s input if you have any specific health concerns regarding your diet. This week, Nick interviews former pro-wrestler and the world’s tallest competitive bodybuilder, Aaron Reed. Not only has Aaron worked hard to become a beast of an athlete, he’s also the author of the nutrition book The Supernatural Lifestyle, which serves as the basis for the Eat Like Aaron meal prep service he offers in Tampa Bay. The road that got him to where he is today has not been a cake-walk. In fact, Aaron faced a humorless, life-threatening a-hole, also known as leukemia, as a child. He was diagnosed young and had to beat that monster before he was able to follow in his family’s athletic footsteps. His late start didn’t deter him from finding his passions, though. Aaron learned early on that he was good at lifting weights and sought his inspiration from legend, Arnold Schwarzenegger. Fast forward a bit, and Aaron talks about his days in the WWE and how an injury as a pro wrestler led to him discovering that he had hepatitis. Faced with the choice of going back on chemotherapy, he made the decision to treat his illness with nutrition. A lack of help from other fitness experts led him to become a self-taught nutritionist, passionate about using his diet as a healing and strengthening force in life. His learned expertise in nutrition resulted in him writing his book in 2011 and subsequently starting his meal prep service, which focuses on raising insulin sensitivity (that’s a good goal) by eating more fat on its own and fewer carbohydrates. Aaron also shared his belief that artificial sweeteners are a big no-no because they dull insulin sensitivity and may be the cause of visceral belly fat. So don’t expect to see those anywhere in his meal options. As the first body builder we’ve interviewed for the podcast, Aaron set a really high bar (and not just because he’s 6’7″)! He’s a friendly and talkative guy with an incredibly inspiring story and a clear passion for nutrition. Seeing how far his knowledge has already taken him is motivating proof of just how critical diet is to your health. Oh! And just in case you need a little comparison to see what we mean by the world’s tallest bodybuilder, check out the side-by-side selfie of Nick and Aaron below. Let us know how you’re enjoying the podcast between episodes and keep sharing the feedback either on Facebook or by leaving a review in the iTunes store. We love hearing from you! As always, thank you so much for listening and supporting. Hope you are ready to chill with us on this episode as we get into a review and interview on cryotherapy. Nick speaks with Jeff Houghtaling, who is the manager of the Tampa location of US Cryotherapy Tampa, a franchise based out of California. They discuss the difference between US Cryo’s whole body cryotherapy (WBC) and the partial body cryotherapy aka cryo-saunas (i.e. different cooling component, more thermoreceptors stimulate, breathing in cold air, etc. – more info). They also chat about the WBC chamber, which a group of ETT clients bravely jump into later in the episode. The benefits of cryotherapy are varied and attract a number of different types of clientele – from athletes to people looking to reduce wrinkles. Because the therapy uses pretty extreme cold temperatures, there is quite a good deal of safety equipment and procedures include covered hands, feet, ears, nose and mouth, along with limited exposure times (3 minutes is the max for the full WBC chamber). Nick shares his initial reaction on how much more intense the full chamber was than a cryo-sauna. 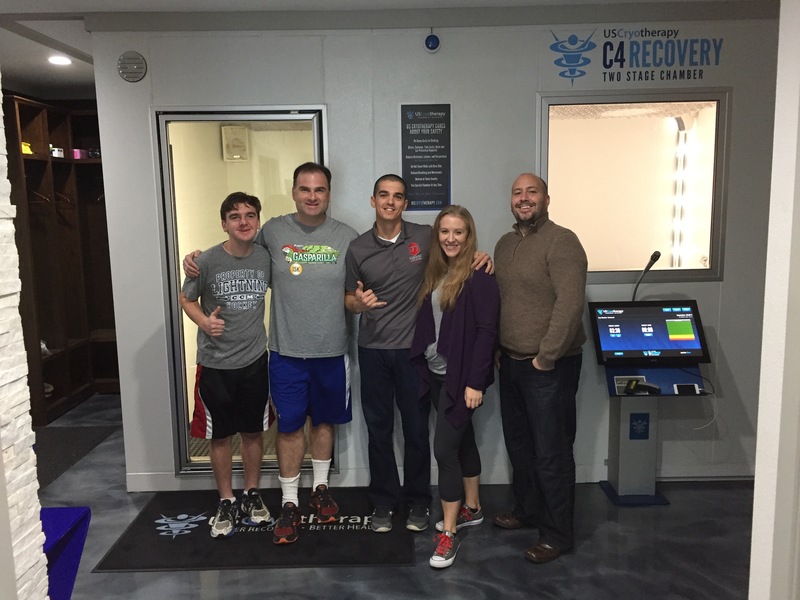 There’s more to the cryotherapy facilities than just the chamber, there’s a warm-up area and Jeff describes all the various equipment they have. While it’s not mandatory, there are some benefits that Jeff goes through why the equipment should be used. The ETT team ventured into the unknown with a group therapy session and we interview everyone for their reactions after emerging from the frosty chamber, including frozen eyelashes (probably good to not wear mascara in the chamber). These heat photos track the before and after from Nick and my trip into the WBC chamber. Overall the whole crew’s experience was really positive and almost everyone walked out wanting to try it again in the future. Armed with a new appreciation for the cold, US Cryotherapy taught us all about our limitations and that we can all use a good chill from time to time. Don’t forget to drop us a line between podcasts and keep the feedback coming either on Facebook or by leaving a review in the iTunes store. This week’s menu highlight features another one of my wife’s awesome culinary creations. The dish below combines shrimp, spinach, mushrooms and spaghetti squash in an olive oil, butter sauce to produce a fantastic weekday dinner. Not only does this meal’s caloric breakdown match my desired macronutrient intake (60% fat, 25% carbs, 15% protein), the spaghetti squash produces far less of an insulin response than its similarly named refined carb doppelgänger. I’m not really into counting calories but if you are, spaghetti squash has 20 calories per cup compared to pasta’s 100. It also contains 24 less grams of carbohydrates than pasta and is full of important vitamins and minerals like vitamins C, B and folate (source). It may take a little longer to prepare than pasta, but the end product is much more flavorful and better for you. Even though these fruits, yes they’re fruits, are harvested in the fall, you can still get them at the grocery store into winter and early spring. Grab one on your next trip to the grocery store and send us some pics of your spaghetti squash creations.